Nineteen search dogs played a vital role in the aftermath of the onslaught on the capital, seeking suspects and detecting explosives to keep the public safe when terrorists struck at both London and Westminster Bridges as well as Borough Market two years ago. To mark their devotion to duty, seven dogs from the Metropolitan Police and British Transport Police are being decorated with the animal equivalent of the OBE on behalf of all the highly-trained animals involved in the aftermath. The honours from veterinary charity PDSA were announced today when the dogs and their brave handlers returned to the scene of their finest hours. 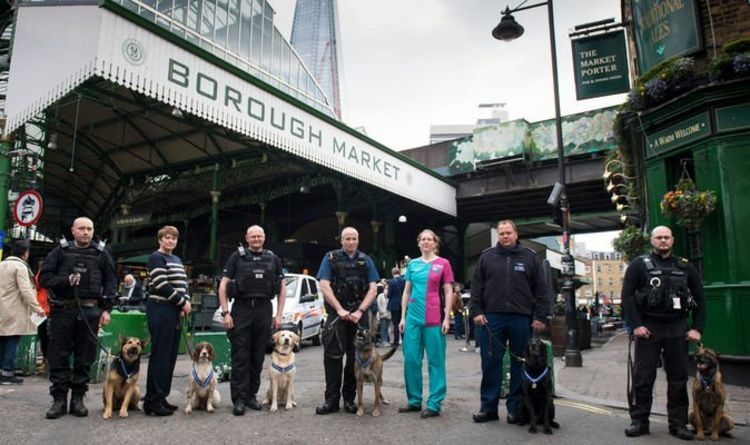 PDSA vet Rosamund Ford met the dogs and their handlers at Borough Market, where Islamic terrorists killed eight people and injured 48 in a vehicle-ramming and knife attack in June, 2017. The seven dogs chosen to represent the full contingent of dogs who played their part in the June attack and the one at Westminster three months earlier are Met dogs Kai, Delta and Dave, while BTP’s dogs Bruno, Marci, Jax and Bobby are also being decorated with the PDSA's Order of Merit. An indication of the essential role police dogs and their handlers play in disasters such as terrorist incidents is highlighted by the strict safety protocols that declare emergency services withdraw until a scene is confirmed safe. Dogs and their handlers put their lives on the line to secure areas for casualties to be treated. At Westminster, where five people, including a police officer, were killed by a lone wolf terrorist, BTP Dogs Ollie, Oscar, Bruno and Scooby searched through the chaos for potential devices and were joined by Met Police dogs Kai and Bruce who searched the car used by the attacker. The London Bridge and Borough Market incidents saw three terrorists use a van to knock down 10 pedestrians before spilling out onto the streets in suicide bomber vests to run amok in the nearby pubs and bars. BTP General Purpose Dog Teams were called to the scene to clear the streets, with Jax, Marci, Johnny, Rocy, Tara and Bobby searching for more than 13 hours, virtually non-stop. Met Police Dogs Alfie, Dave, Poppy and Robson also carried out systematic searches of the area with novice dog Kai. Delta worked with his handler and a team of firearms officers to checked more than 30 buildings. At one stage dog teams were searching for a suspect who was still missing, while Casper and Romeo searched the terrorists’ suicide vests for explosives. Senior BTP and Met officers welcomed the dogs’ recognition. Chief Inspector Graham Horwood from the Met’s Taskforce added: “Our Police Dogs and their handlers were required to work in the most challenging environments and we are delighted to hear that their extraordinary work has been recognised. The dogs will receive their medals at a ceremony later in the year. The Met and BTP Dogs will take the total number of PDSA Order of Merit recipients to 27, including 17 dogs and 10 horses. The PDSA medal, instituted in 2014, recognises animals who display outstanding devotion to their owner or wider society, above and beyond normal companionship, and represents an exceptional example of the special relationship between animals and humans.